If you’re a true cheese-lover, there’s no doubt you’ve heard of Jasper Hill Farm. Brothers Andy and Mateo Kehler bought the farm in 1998 and have since built what some may call a cheese empire in beautiful Greensboro, VT. Their cheese is sold across the country and was even served at the White House when the French president visited. While there are many factors contributing to the Kehler brothers’ success, one of the critical components has been the beautiful, yet hearty, Ayrshire breed. A tried-and-true breed, Ayrshires have proven to have all the characteristics they’re looking for. For example, Jersey milk, while it may have a higher yield, has large fat globules. Since the ratio of fat to protein is so important in cheese-making, Ayrshire milk—which has a more balanced fat and protein ratio—is often preferred. 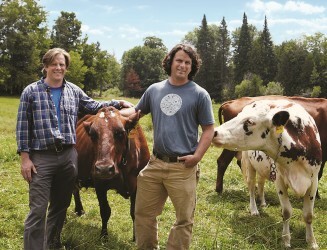 But having an Ayrshire herd also comes down to heritage for the Kehler brothers. He and his brother recognized early on that the quality of your cheese is only as good as your milk, and you can’t have good milk without a healthy herd. That’s why they’ve worked hard to come up with a combination of farm practices that result in the best product possible. For example, at Jasper Hill, the cows do a lot of walking and are put out on a fresh piece of pasture after every milking. Through the months of May to October, the herd grazes freely. During the winter months, they are fed a dry hay—never silage. These are all factors that combine to make Jasper Hill Farm cheese a desirable product. It is clear the Kehlers place a high value on the Ayrshire breed. They actually intend to cross-breed their Ayrshires with the Holsteins on the second farm they own. In addition to the premier milk used in their cheeses, their technique is one of the best found in the country. After all, they did learn the art of cheese-making in Europe. Mateo worked for Neal’s Yard Dairy in the U.K., a leader in the artisan cheese industry. “They really salvaged a lot of traditions that were on the brink of distinction,” Mateo says. Those years working in their cellars maturing cheese and for a few suppliers across the U.K. were instrumental in laying the foundation for Jasper Hill Farm and their philosophy when it comes to cheese-making. When it comes to the future of Ayrshires, though, the Kehlers recommend staying true to the breed and utilizing their already positive attributes. The Kehlers really are fans of the Ayrshire breed and recognize them for what they truly are—a cost-effective investment and a remarkable breed when it comes to quality milk and cheese.